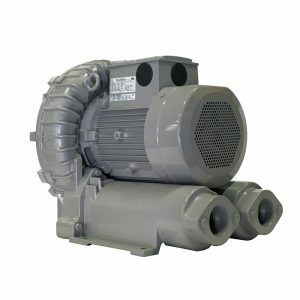 Unit comes complete with a direct-drive, 10.7 HP TEFC motor, available in voltages of 208-230/460 or 200/400 3-phase. All units are provided with threaded flanges. A pilot-duty thermal protector is standard equipment. All versions have NEMA class B insulation, are UL recognized, and CSA and CE certified. Prices subject to change without notice. Click here for ring blower guide. See our Accessories section at the left for filters, filter assemblies, elements, silencers, and relief valves.